When a crowd funding champagne is held for a book, the sponsors would obviously get a copy of the book. But Patrick Berkhof wanted something different for his campaign: he is giving his sponsors 3D prints of his steampunk story props he designed. The fantasy story of Djizary – The Living System is about a labyrinth world filled with strange inventions. One example is the rent-stairs and people can use them to get over a wall instead of taking a day’s walk through the confusing streets. Patrick is a passionate industrial designer before he became a writer. During his work he came in contact with 3D printing and software early on. When he decided to start the campaign for his début, the combination of writing and technology was obvious. Thanks to 3D printing he could make his vision more real than ever before. 3D printing is a powerful tool for Patrick to create a more interesting fantasy world. Not only because he can share his 3D designs with his readers, 3D printing also helps sculpting accurate scenes in his book. Designing and printing scale models of objects and street scenes will make a more believable story. The first model available is a 20 cm high rent-stairs and fits together like a model kit. Made with four different PLA materials it takes about 10 hours to print on his Builder and assemble one. 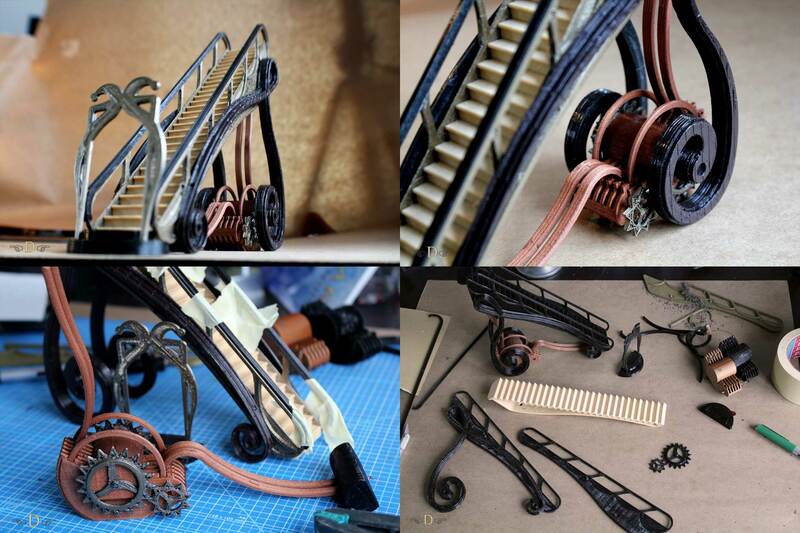 The steps are made with woodfill PLA and the motor and piping with copperfill PLA. The rest of the parts are made with different coloured PLA. Other models like a steambike, bridge and Contentimus will be available later during the publication of his book. Sadly the story of Djizary will only be available in Dutch for now, tough foreign sponsors can help fund the campaign. Hopefully it will exceed the target so there will be enough funding for a translation.